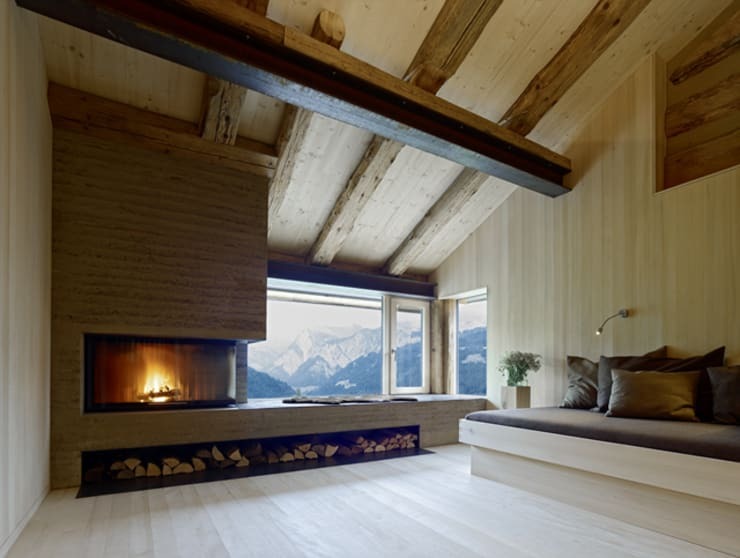 A picturesque Swiss mountain home has caught our attention today, and we are dying to explore it breathtaking setting as well as elegant wooden construction. Stallausbau S was rendered by the creative architects at Hammerer ZTGMBH Architekten in the gorgeous city of Aarau, and is a quaint wooden wonder. The interiors are warm, cosy and lavishly lined with wooden walls and solid beams and pillars. And large glass windows offer enchanting views of the heavenly landscape. 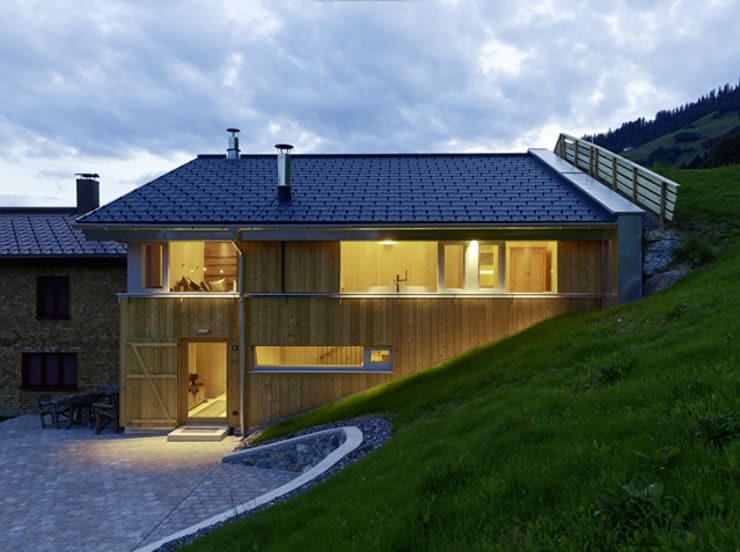 Elegant simplicity and minimalism are the mottos of this serene abode surrounded by lush green mountain slopes. 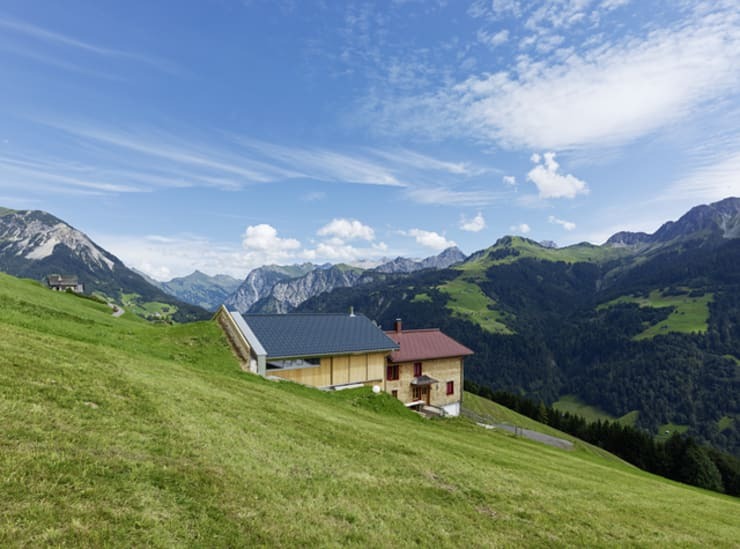 Set amidst rolling green mountains with snow-capped peaks in the distance, this lovely wooden home entices with its charming simplicity and rustic appeal. It is the perfect retreat for those who want to escape the urban din and bustle, and connect with the pristine freshness of nature anew. With a forget-me-not blue sky above, you will want to roll around in the grass on pleasant, warm days. Here’s a closer look at the picture perfect and inviting residence with its light-hued wooden walls and grey shingles on the roof. Large glass windows allow the soft glow of the interior lights to reach the grassy patch and stone patio near the home. The overall effect is soothing as well as magical. Solid wooden beams line the walls as well as the peaked ceiling of this cosy and quaint living area. The warmth and homeliness of wood enhance the appeal of the sleek and trendy fireplace, while a black metal chimney adds pizzazz to the space. A metallic deer head and a slim concrete planter make for aesthetic touches, while large windows on the right usher in ample sunlight. 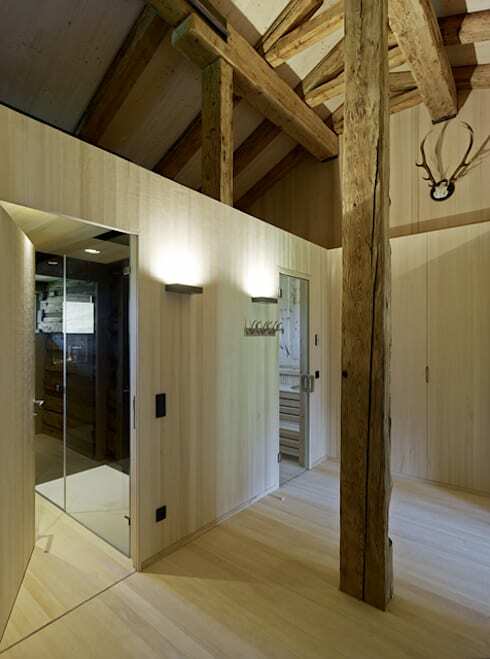 Wood continues to create sensible partitions for the interiors of this residence, by cordoning off more private quarters nicely. We love how light-hued walls and floors combine with slightly darker and roughly hewn pillars and beams for a countryside look. 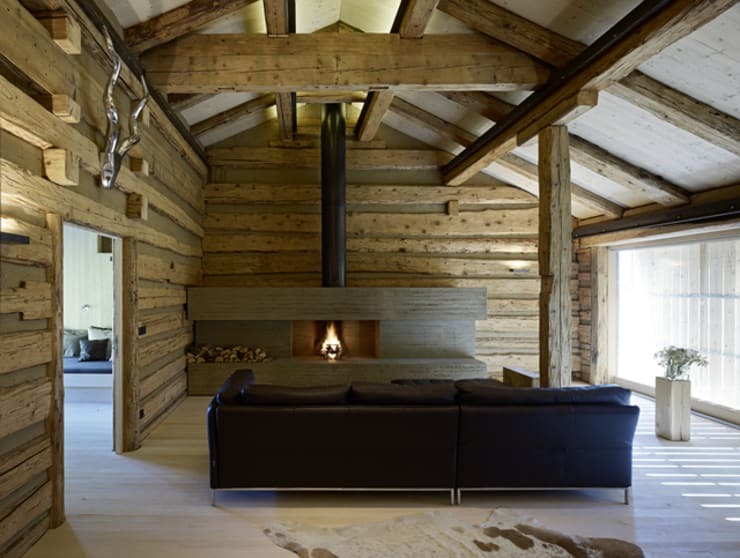 This amply and naturally-lit room wows with its sloping and beam-lined ceiling, and sleek and fashionable fireplace with a trendy nook for housing wooden logs. The day bed appears to be affixed with the floor, and features earthy-hued upholstery for a comfortable vibe. A minimalistic reading light mounted against the wall lets you laze around here with a book, while you admire nature’s beauty through the glass windows intermittently. With glass windows generously lining its left hand side wall, this spacious and airy bathroom gets oodles of natural light throughout the day. A curvy bathtub and sleek fixtures make stylish statement in this gorgeous wooden sanctuary, while you soak in the view of the verdant mountains and sparkling blue sky. 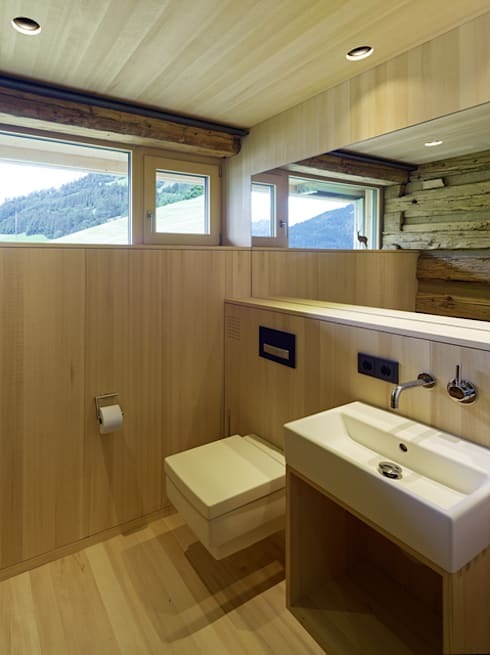 Modern, simple and elegant sanitary wares in white complement this wooden toilet beautifully. The shelf under the sink provides ample space for storage, while a long mirror lends the illusion of spaciousness. 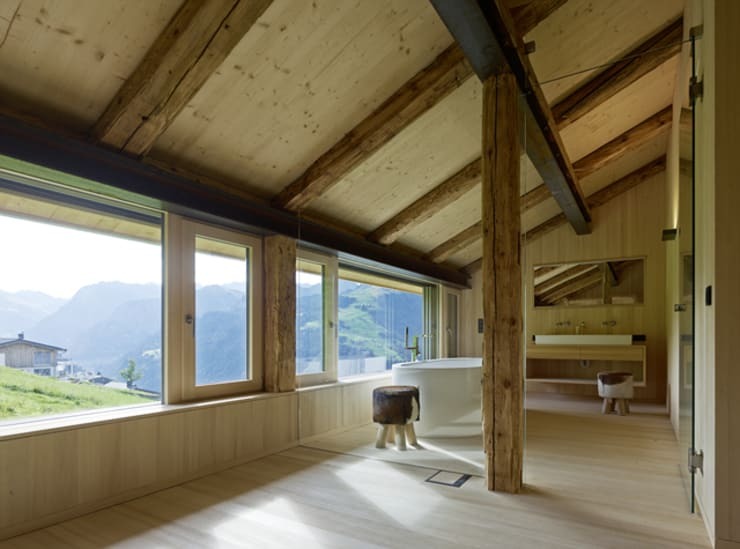 Sleek windows allow sunlight to pervade the bathroom and also provide ventilation. Hope you enjoyed exploring this stunning mountain abode as much as we did. Take another tour for more ideas - Drawn Inspiration From This Tropical Dream House.